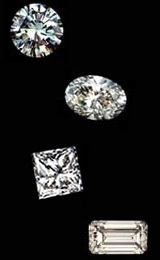 Direct Diamond Center, a division of Texcape Diamonds Inc. was established in Dallas in 1980. Our roots stretch back to the diamond industry in South Africa and Antwerp in the 1930s & 1940s. We supply fine diamonds with grading reports from several independent laboratories as well as diamonds without reports. Working with diamond firms and diamond professionals in Europe and elsewhere, we are able to provide excellent choices and advice for your important diamond purchase. It’s easy - just call us toll free at (800)232-9446 and speak with one of our diamond professionals about the particular diamond you are seeking. Over the last thirty years, we’ve supplied beautifully cut quality diamonds of just about every shape, size, color and clarity. Our commitment to you is total. Your complete satisfaction is our goal. In the Dallas/Ft.Worth area, we welcome your visit to us by appointment. Please call us at (800)232-9446, or locally at (972)980-7632, and we'll be happy to set a time.